PHUKET: Phuket chef Daniel Isberg wowed the crowd at Phuket Adventure Mini Golf in Bang Tao last Thursday night, creating a special Spanish paella for diners. 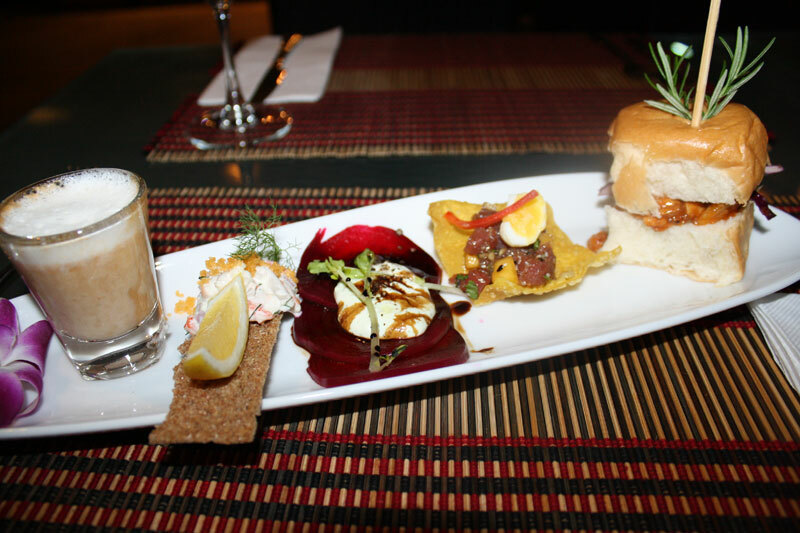 A selection of gourmet tapas, including lobster and vanilla cappuccino. Daniel is Swedish but has been based in Phuket since 2009, and runs his own event catering company. First up for the evening were gourmet tapas, consisting of lobster and vanilla cappuccino, shrimp salad, beetroot carpaccio with feta cheese crème, white truffle oil and balsamic reduction, wonton chips with tuna tartar and quail egg, and a pulled pork burger with smoked jalapenos. Next up was the spectacular paella, made from Spanish rice, saffron, white wine, seafood and chicken stock, and mussels, prawns, chicken, squid, smoked bacon, roasted bell peppers and other vegetables. “The secret to good paella is to get a good base flavour – I use very good virgin olive oil mixed with herbs and garlic,” Daniel explained.